Purple hair helped me to be brave. I’m an oldest child, a Scorpio, an achiever. I’m terrified of letting others down. Of looking stupid. Of failing. This fear has kept me from taking big leaps throughout my life. My method of avoiding risk is to procrastinate on opportunities just long enough for them to pass me by, therefore removing the possibility of failure because I didn’t even try. Whenever I do this I’m momentarily relieved, if I’m honest. Then I feel nauseated. Then angry. Then ashamed at my cowardice. Some families openly encourage failure. If the kids aren’t doing things outside their comfort zone and failing, they aren’t trying enough new things. They foster the idea of being at peace with failure so they won’t be afraid to try, as opposed to punishment when they come up short. This is an amazing gift. My dear friend Abbie has two young girls, and she does what I was never able to do when my boys were little: She steps back and literally lets them fall (within reason, keeping the ER out of the picture is the goal). She allows them to pick a precarious path if they wish, to see the results of their gambles. I feel myself lurching forward when I see them teeter, nearly fall, actually fall. She bites her lip and observes. They look around, brush themselves off, get up and try again, or move on. Sometimes they howl for help, and she’s right there. They know they have a safe place to land. As a result, these girls are daring. They are independent, resilient risk takers. Will that translate into more adventurous life choices? Only time will tell, but this foundation formed through scraped knees and some rescues from on playgrounds can’t hurt. 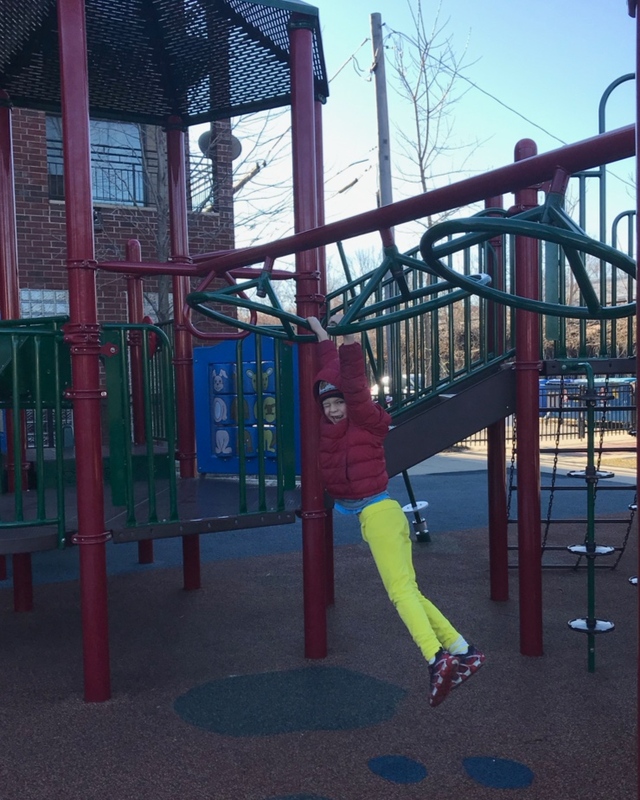 Now that my kids are a bit older, the playground is a relatively safe place, but the stakes for risk taking are even bigger. It’s hard to understand that the painful process of trying new things is where growth comes from. I want them to read challenging books, both in reading level and ideas, and to question their own beliefs. I want them to try difficult math problems to be creative problem solvers. I want them to swing and to hit the winning run, but also to miss and feel what that’s like, too. And I want them to watch me fail, too. They will see me get up, figure out what I learned, and try again. It is good for all of us. Failing builds strength, but it also builds respect and empathy. Even knowing that, it’s hard. I still don’t like the feeling: Stomach clenching, edge of headache, hot/cold sweats. Standing on the edge, ready to fall into the unknown, putting myself out there. But here’s what I do like: Sticking the landing. Getting positive feedback. Being thanked for my hard work and intelligence. Discovering opportunities that come up following failures, things that would have remained the road less traveled if earlier efforts had been a success. Being more, doing more, than I ever thought I could. As my birthday approached, I thought about where I wanted to go in the next year of my life. I found a box of purple hair dye that I bought on a whim the previous year. I’ve long wanted purple hair but for months this box has gathered dust under the sink. What was I waiting for? I read the directions and got to work. My scalp was a little tinged in a few places and I had one slightly violet eyebrow in the bargain, but I did it. My hair is purple. It’s subtle, and just in the front, but I love it. It sparkles in the sunshine and it’s a cheery, bright color. People hardly notice it, but I do and it makes me happy every time I pass a mirror. What I like best is that few people have noticed the change. It’s like my special secret superpower that I can pull out when necessary. It’s a little thing, but it’s a start. Just like most of the times when I’ve taken that leap I asked myself: Why did I wait so long? This time I got an adrenaline rush, which I far preferred to regret. So in 2019, I’m going to push past my fears, make myself a little sick, a little scared, climb a little higher and leap off with more gusto than I’ve dared to in the past. I’ll probably have a skinned knee or two, but luckily I have a safe place to land. Or maybe I’ll even fly. This essay also appeared in Fete Lifestyle Magazine in January, 2019.